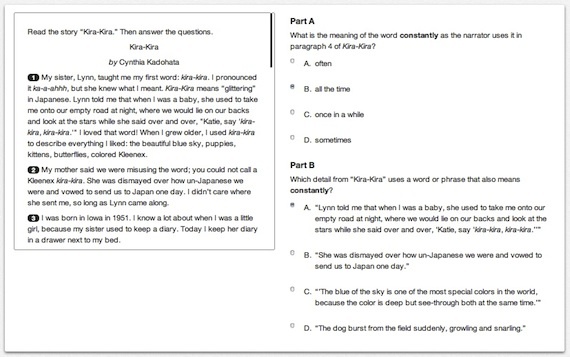 PARCC has made its sample test questions available for computer-based practice. Sample items for the upcoming assessments of Common Core State Standards have been released previously for testing on paper across all grade levels; now PARCC schools "will be able to engage with the sample items using computer-based tools such as drag-and-drop, multiple select, text highlighting, and an equation builder." PARCC, the Partnership for Assessment of Readiness for College and Careers, is one of the two state consortia tasked with developing assessments for Common Core State Standards that will be administered nationwide in the 2014–2015 school year. Eighteen states and the District of Columbia currently make up the coalition, representing about 22 million K-12 students enrolled in public schools. Field tests of the assessments will begin this March involving 1.2 million students in 14 PARCC states. But any PARCC student can access the practice tests in order to familiarize themselves with the technologies involved. A PARCC sample test item in the grade 3-5 category asks students to fill in a bubble to choose the correct answer from a list of four possible answers. "This spring's field test will allow us to try out PARCC test questions, ensure the questions are aligned to the content area they cover, and build the best test we can," said Massachusetts Commissioner of Elementary and Secondary Education Mitchell D. Chester, chair of the PARCC Governing Board, in a prepared statement. "[Wednesday's] release of fully functional sample test questions will allow schools and students to experience and become comfortable with the new testing format in advance of the field test." "The educational value and the quality of the test items really becomes evident when you see the items on the technology platform they were intended for," said Laura Slover, PARCC CEO, also in a prepared statement. "These new assessments are tied to more rigorous expectations for students that will prepare them for success after high school in college or careers." Sample Items for grades 9 through 12. Note that you must meet certain browser requirements. For example, Google Chrome on Mac is not supported. Nor are some versions of Firefox. Technical requirements can be found on PARCC's site, but browser requirements are based on Pearson's TestNav 8 minimum requirements, listed on Pearson's site. Additional details and sample items can be accessed on PARCC's site.